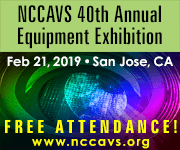 To provide a monthly forum for sharing technical knowledge and leading research, the NCCAVS is affiliated with and assists four technical users groups — Chemical Mechanical Polishing, Junction Technology Group, Plasma Applications, Bionanoscience Research, and Thin Films. These groups hold regular meetings during which members give technical talks on current developments in the field followed by a group discussion. Membership in each group is FREE and is not limited to AVS members.